An efficient method to radiolabel symmetrical [11C]ureas using 1,8-diazabicycloundec-7-ene (DBU) and cyclotron-produced [11C]CO2 has been developed. [11C]urea derivatives were obtained when aliphatic and aromatic amines were used with excellent radiochemical yields (RCYs) of over 70%. The mechanism of the reaction is proposed on the basis of control experiments. 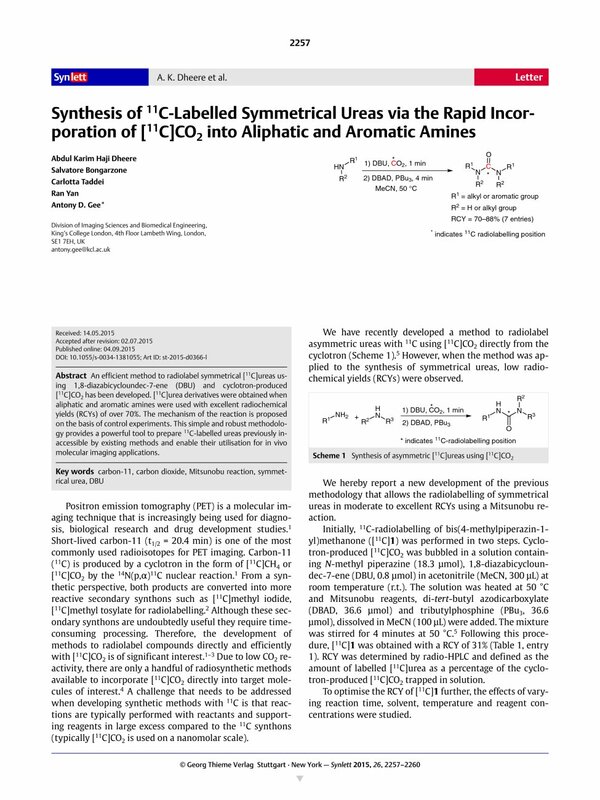 This simple and robust methodology provides a powerful tool to prepare 11C-labelled ureas previously inaccessible by existing methods and enable their utilisation for in vivo molecular imaging applications. Supporting information for this article is available online at http://dx.doi.org/10.1055/s-0034-1381055. 6 See Supporting Information for full experimental details and compound characterization. Synthesis of Compound 1: Diisopropylethylamine (194 mg, 1.50 mmol) was added to mixture of 1-methylpiperazine (50 mg, 0.50 mmol), and 4-methylpiperazin-l-ylcarbonyl chloride (122 mg, 0.75 mmol) in CH2Cl2 (20 mL). The resulting mixture was stirred at r.t. for 1 h. Then, the mixture was concentrated and recrystallised from EtOH to give 1 (30 mg, 27%). 1H NMR (400 MHz, CDCl3): δ = 3.59 (m, 8 H), 2.56 (m, 8 H), 2.90 (s, 6 H). 13C NMR (100 MHz, CD3OD): δ = 163.65, 54.03, 45.04, 43.79. HRMS: m/z [M + H]+ calcd for C11H22N4O: 227.1794; found: 227.2003.